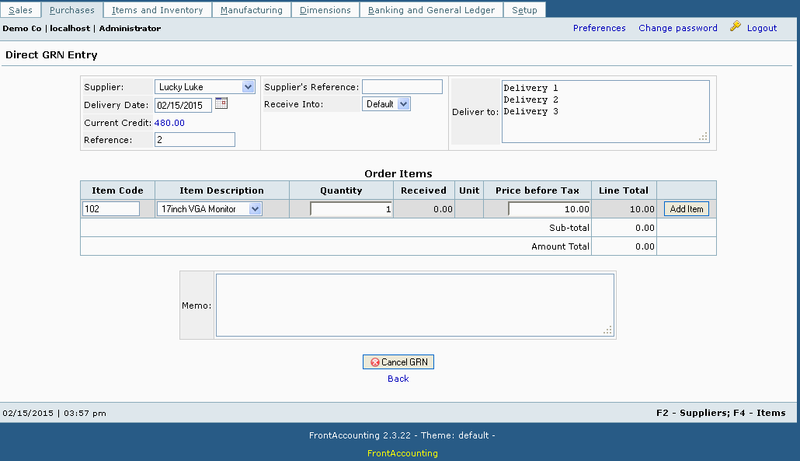 Enter GRN without Purchase Order being entered previously. You can use the Reference field in the form for entering the Supplier GRN No. if you need to register that. If the Supplier Currency is different from the Company's default currency, then it's exchange rate must be available for the date of entry in question. Forum Post - Migrating from v2.3.11 to v2.3.12+ will need all the GRNs that were 0 to be set to blank () value. Otherwise, while trying to change the allow negative inventory checkbox in the gl_setup will result in an error message of: Before GRN Clearing Account can be changed all GRNs have to be invoiced''.